Application: Bathroom, kids room, hallway, living room, bedroom, study room etc. Function: Night light, Sleeping Companion Lamp and Home decoration. Three Installation Ways: 1) Hanging with top strap; 2) Wall Mounted with Non-trace nail; 3) Hand-held with top strap. USB Rechargeable: Built in 700mA rechargeable battery charged by Device support USB port. Full charge needs about 3-5 hours. Three Installation Way: 1) Hanging with top strap; 2) Wall Mounted with Non-trace nail; 3) Hand-held with top strap. 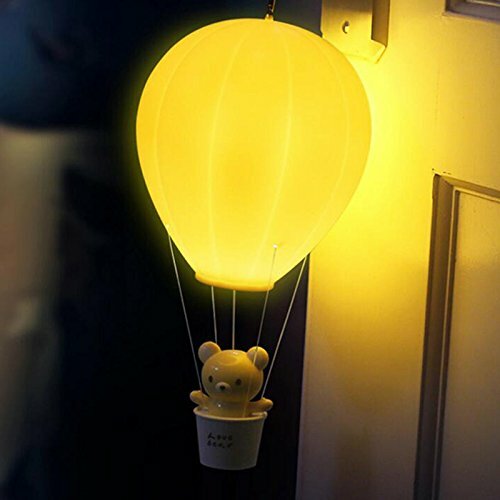 Creative Design: Hot Air Balloon Shape, Cartoon Bear/Rabbit in basket, High quality ABS Plastic, 10 minutes power off Timer, Perfect for Kids/Baby Gift. Dimmable Light: With 3 Light Modes, Dim-Mid-High Brightness Light. Controlled by Touch Switch, easy to operate. Light Source: Energy Saving LED lamp, High brightness, Power 0.8W, Average lifespan up to 30,000 hours. If you have any questions about this product by Zehui, contact us by completing and submitting the form below. If you are looking for a specif part number, please include it with your message.